Now that you have selected and installed your new garage door, it is important to also discuss the ventilation options on offer. You likely store certain items that release harmful fumes in your garage, such as paint or cleaning chemicals. Proper ventilation will prevent these fumes to reach dangerous levels that could become a threat to both your home and your health. The garage technicians at Colorado Overhead Door Co. are here to go over some of the best ways to properly ventilate your garage. Many garages come with open rafters these days, and this should provide adequate ventilation for the common household. Even in the short time it takes to park your car, exhaust becomes trapped inside once you have closed your garage door. Open rafters will allow these fumes to to quickly escape and be replaced by breathable air. Many mechanics resort to using hoses in their garages, as they allow a direct route for car exhaust. If you plan on doing auto repairs that require a running motor, it would be advised to connect a hose to the exhaust pipe and force the fumes to flow outside. 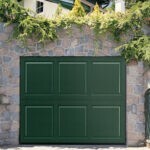 Never leave a motor running in a closed space, so be sure to leave your garage door open. If you use your garage for projects such as painting or lacquering, you might want to think about installing a wall mounted fan to your garage. This does require that you cut a hole in your garage wall where a fan will be placed. These usually are placed waist high, and should be located close to the area where the work will take place. If you followed our instructions for organizing your garage, then it should be easy to locate the area where a wall mounted fan would make the most sense. Whenever you suspect that your garage filling up with fumes, simply open your garage door and allow for the area to air out. Once the room has had time to freshen up, locate the source and decide how to best attack the problem. Every customer has different needs, and these three options should offer some solution to your needs. As always, feel free to contact Denver’s garage experts for more advice on this matter.